Existing Users: You will automatically receive a notification from Appy the next time you open your app. The notification will lead you to update the app to access all the latest features of Appy Couple. Without this update, none of the changes you make through the web version will save and publish. New Users: The app you will find in Apple's App Store will be the newest version. 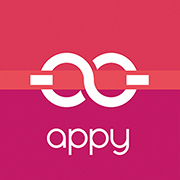 Simply download Appy Couple the way you would with other apps, create an account and enjoy the latest and greatest. Existing Users: You will automatically receive a notification from Appy the next time you open your app. The notification will lead you to Google Play to download the latest version of Appy Couple. If you do not install this version, none of the changes you make through the web will save and publish to the app. NOTE: Appy 3.0 for Android devices will have a new home in Google Play. Click here to download the correct version directly. New Users: You will find two versions of Appy Couple in Google Play. They will labeled "Legacy" and "New." Please download the "New" version the way you would with other apps, create an account and enjoy the latest and greatest.